This week, I find myself in the unique position of watching current events that further two previous topics of mine. Marvel recently announced changes to two of its major characters- giving the title of Captain America to African-American hero the Falcon and that the title of Thor will be carried by a woman. These announcements have been met with much speculation, including accusations of race and gender baiting. While I cannot give a definitive answer to that debate, I would like to examine them as they relate to my earlier discussions on race and gender in writing. To begin, we should first establish exactly how these changes are coming about. For Cap, Steve Rogers has had the super-solider serum drained out of him, and is no longer able to function as Captain America. As such, he has assumed a strategic role and given the mantle to Sam Wilson, aka the Falcon, a former sidekick and long time friend of the Captain. Of the two changes, this one is less of an obvious ‘baiting’. Unlike DC’s move to create diversity by placing Teen Titan Cyborg in the Justice League (despite his having no previous association or status with the group), Sam Wilson has been a part of the C.A. 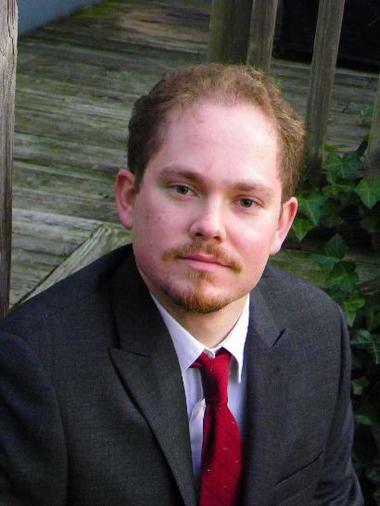 mythos for years, and has operated as a protégé to Rogers for almost as long. Beyond former sidekick Bucky Barnes, there are few else who could hold the shield of the Captain. As for his skin color, I again state that Wilson is a hero in his own right with a well established history that gives him credibility. Also, the C.A. mythos have already established Isaiah Bradley as the ‘black Captain America’, the lone survivor of early American tests to recreate the super-solider serum on black soldiers (who died as a result and were kept secret). Therefore, placing Sam as the new Cap becomes more meaningful then learning that the previous ‘black Cap’ carried shame as well as pride with him. Thor’s change is more difficult to determine. As of this writing, the story calls for Thor to become unworthy of his hammer, which will be taken up by a female character. As this change has just been announced, no successor or method has been named. This makes it more difficult to judge; Cap’s succession contained true to form reasoning and a protégé taking up the costume. Without knowing how or why these changes occur, or who will take up the hammer, I cannot judge it accurately. However, based on what is known thus far, this change has more of a ‘baiting’ feel to it. 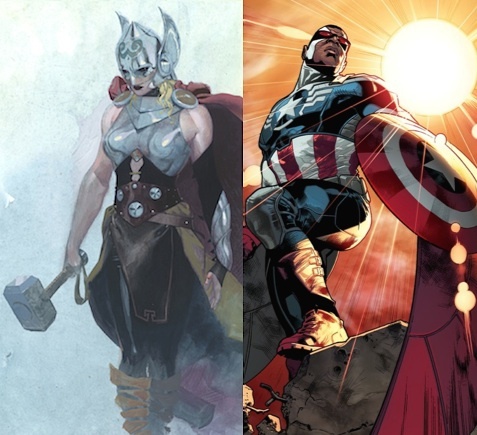 While Cap’s mantle can be passed down, Thor is a mythological figure and is the ‘god’ of thunder. Unless his personality is also placed with the new Thor (unlikely), this new Thor could very easily seem a pretender and inexperienced. Also, while there has always been call for diversity in comics, I doubt that women find draping a woman in the guise and identity of a male hero is much of an improvement. Still, too little is known to make a proper evaluation; but since Marvel did a good job pulling off Loki’s temporary gender change, there is still a possibility this could work. So what do we take from this? Is this a chance to update and adapt heroes or simply a ploy to increase readership? In honesty, I do feel this falls under a ploy. Despite the logic behind the Falcon’s ascension, and the too-early nature of Thor, I simply don’t believe Marvel would permanently alter two of its largest properties. One simply needs to look at Superior Spider-Man (in which Dr. Octopus temporarily took over the mind and body of Spider-Man) and how its run returned Peter Parker to the front just in time for “Amazing Spider-Man 2”. By the time the next Marvel film with Cap and/or Thor rolls out, I think things will have reverted. So what do we take from it as writers? First, how well Cap’s story not only follows logic and history, but how it also keeps skin color at the back- this is someone that proven himself, and just happens to be a minority. Second, how simply dressing an opposite gender character in an established identity may not be diversity as much as marketing. And third, that writers still need to watch how and why they create minority and female characters, because all this controversy clearly says there are still issues attached to it. Last week, I discussed a comic book movie adaption with The Crow. Comic books have always been a great passion of mine, particularly the work of DC Comics. The company responsible for heroes like Superman, Batman, and Wonder Woman (collectively referred to the Trinity, due to their status as the first regularly published comic heroes), DC is the oldest comic book publisher in America, and has some of the most iconic heroes and villains in comics today. And while their comic adaptions have ebbed and flowed in acclaim, one particular adaption has been a critical and commercial favorite with fans- Justice League, and its sequel Justice League Unlimited. 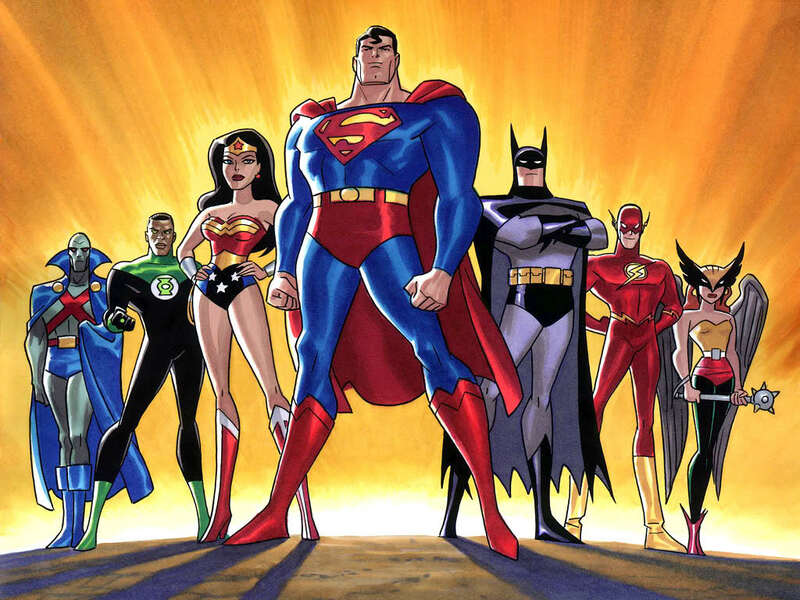 Based on the long running book, and helmed by Batman: The Animated Series creator Bruce Timm, Justice League is a gathering of the greatest DC heroes (the Trinity, The Flash, Green Lantern, Martian Manhunter, and Hawkgirl), into a single team working to overcome threats too great for any of the heroes alone. Watching the Earth from the orbiting satellite the Watchtower, the League dealt with threats such as The Injustice League, Mongul, Darkseid, Brainiac, and other classic DC villains, while dealing with betrayal, loss, the stress of working together, and eventually opening the League to a wide range of heroes in Unlimited. Perhaps the greatest strength of Justice League, both in the comics and the show, is its wide array of characters. Even though the heroes had banded together, this was still a group of characters that had very different personalities, and very different approaches to handling situations. While there were the obvious differences in Superman and Batman (one was the public hero who started the League, the other an urban legend who worked the League part-time), there were plenty of friction in the other heroes. Green Lantern was a former Marine, while the Flash was an impulsive jokester. Wonder Woman was a regal and somewhat naïve Amazon, while Hawkgirl was a gritty, hardened alien police officer. All of these issues were addressed at some point during the show’s run, even used at one point to disband the League in a plot by Gorilla Grodd. However, it made the League a stronger team because they not only overcame their differences and learned to work together, they also managed to remain a group of individuals, each with their own views and theories on how to do their job. And as a result, they gained a strong respect for each other, which is shown in one of my favorite scenes from the episode “Hereafter” where Superman is supposedly killed, a fact all but Batman accept. And there is no stronger team-builder then the scene below, where the Flash is nearly killed. All of this showed me how to really build the Knights up as a team, but keep them as individuals. They needed to be different, they needed to argue, maybe they even needed to hate each other a little. But because they were all needed, because they couldn’t do the job without each other, they had to learn teamwork, and how to respect what each of them brought to the table. Beyond character however, Justice League brought something that most don’t associate with comics or animated TV shows- depth. Bruce Timm has said in the past that he thinks of his work as adult shows that children happen to like, and it truly shows. These were characters that could fly, punch though walls, had magic space rings, and millions of dollars in crime-fighting equipment. At first glance this seems primed for kids, but this was nowhere near earlier attempts like Superfriends (made quite clear when a statue of the Wonder Twins was destroyed in one episode). These were characters that despite all their superpowers, still felt like real people with serious problems to deal with. The episode with the dream controlling Dr. Destiny was a great show of this, as several members faced their fears (Superman fearing that he will grow too powerful to interact with humanity, Green Lantern’s fear that he is simply an extension of his ring, or Flash’s fear that his speed will literally push him past people). But the show also dealt with how far someone might go to get back what they lost ( “A Knight of Shadows”), how far the League should go in protecting humanity (“A Better World”), the League’s lives and connections outside of their work (“Comfort and Joy”), gaining and losing everything you’ve ever wanted (“For the Man Who Has Everything”), and one scene of sacrifice from Aquaman that still amazes me that it ever made air. Justice League might be a cartoon about a comic book, but any writer looking to work on group dynamics would do well to watch this show, or pick up a few books. It also stands as proof that even an idea that seems silly or childish can be portrayed as serious with the proper care and effort. As with my authors spotlights, the best thing I can recommend is to watch the episodes I’ve listed, or almost any episode of the series, to really see these traits in actions. As for the comics themselves, many are adapted from the comic stories (“Hereafter” is based on “The Death Of Superman”, “The Man Who Has Everything” is a classic Alan Moore story), but for comics that were not adapted, I can personally recommend “Tower of Babel,” “Divided We Fall”, “The Tornado’s Path,” and “Pain of the Gods,” all from my favorite run of the series. So head to your local comic store or wherever you get TV from, and check it out. It will help you learn about the most important parts of team building, and at the very least, might push us closer to that Justice League movie.